Kefir Probiotic "LifeWay" with Peach Flavor buy for 5.9900 in store RussianTable with delivery. A creamy probiotic dairy beverage similar to but distinct from yogurt. Lifeway believes it offers the largest selection of kefir in the world. Low-fat or non-fat pasteurized milk is the basic ingredient in kefir. Its effervescent quality stems from the kefir culture, which contains ten active "friendly" microorganisms, compared to two or three in yogurt. With it's 10 live and active probiotic cultures, the good-for-you bacteria, Lifeway Lowfat Kefir is a smooth, creamy and delicious yogurt-like smoothie the whole family will enjoy. Not only does it keep digestive and immune systems intact, it helps prevent common side effects from taking antibiotics, helps with lactose intolerance and weight loss. Plus, it's an excellent source of calcium, protein and fiber. So enjoy Lifeway Kefir...any time of day. 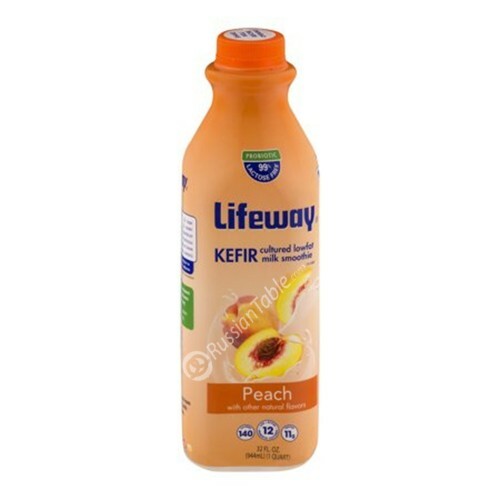 Do you have any questions about Kefir Probiotic "LifeWay" with Peach Flavor?